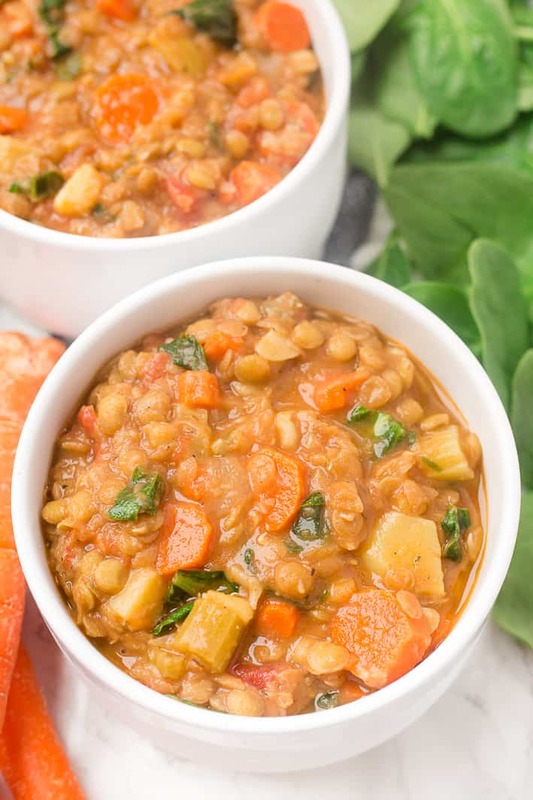 This hearty vegan lentil soup is loaded with spices and vegetables like carrots, golden potatoes, celery, and spinach. It’s a super easy, cozy lunch or dinner! Right up there with guacamole and granola, soup is one of those things I’d always rather do homemade rather than purchase if possible. So, today, I’m sharing this really simple recipe for my hearty vegan lentil soup. • Anyone trying to cut down on their grocery bill since meatless recipes are so budget-friendly! 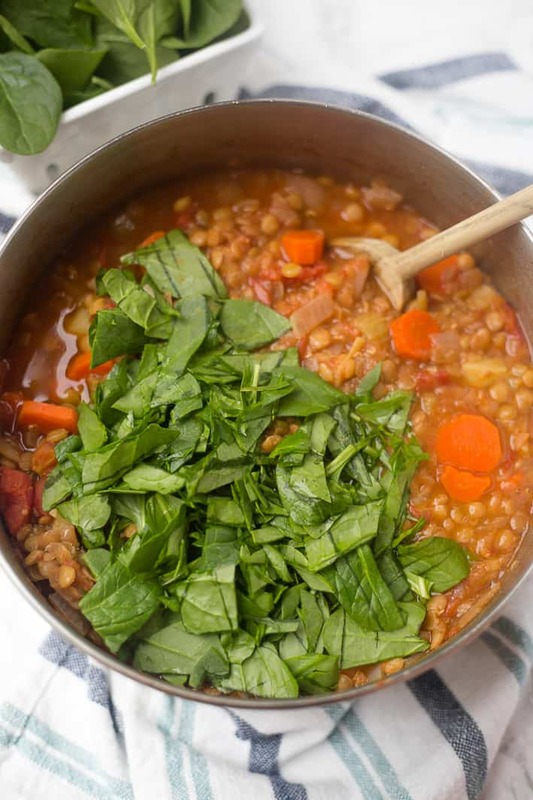 Like many soup recipes, this lentil soup is really adaptable. You could use chopped sweet potatoes instead of golden potatoes, you could sub chopped kale for the spinach, or you could use red lentils instead of the standard green or brown. The base recipe is a perfectly spiced, thick soup that’s super satisfying even with no meat involved. And a squeeze of fresh lemon juice adds a touch of brightness to the soup. The last time I was at home, my mom made a different lentil soup recipe that sounded good, but it required several extra steps, including transferring a portion of the soup to a blender to puree. We both agreed the end result just wasn’t worth it the extra time or dishes to wash.
For a lot of reasons, lentils are an awesome food to add to your diet. They’re high in fiber, protein, minerals and vitamins, and low in calories. They’re also high in insoluble fiber, which is great for digestion, and soluble fiber, which helps reduce your cholesterol. You can feel GOOD about eating a big bowl or two of this soup! And if you have leftover soup, you can freeze it in a big container or in individual servings. I use pint wide-mouth mason jars, which are the perfect size for one big serving, to freeze leftover batches of soup every week or two. Then, the night before I want to eat it, I place the container in the refrigerator to defrost and then reheat the soup on the stovetop or in the microwave. Like I mentioned before, this soup is vegan. But if you’re like me and love toppings, I highly recommend serving this soup with shredded parmesan if you’re not strictly vegan or vegetarian (some parmesan cheese contains animal rennet). If you try this homemade vegan lentil soup recipe, feel free to let me know in a comment or take a picture and tag me @livbane on Instagram. Hope you LOVE it! 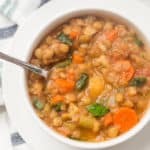 This hearty vegan lentil soup is an easy dinner recipe, perfect for Meatless Monday or a healthy, inexpensive dinner recipe! Place a medium or large pot on stove over medium heat. Add cooking oil and chopped onion. Cook for 5-6 minutes, until onion is tender. Add chopped carrots, celery, potatoes, lentils, diced tomatoes, vegetable broth, water, salt, pepper, garlic powder, cumin, and thyme. Turn heat up to high and bring soup to a boil. Turn heat back down to medium-low and lightly simmer for 25-30 minutes, or until lentils and potatoes are both tender. Run a potato masher through the soup (or use a fork) to lightly mash some of it to thicken. Chop fresh spinach or kale. Add spinach/kale and lemon juice to the soup and allow the greens to wilt. Enjoy! Store leftover soup in the fridge for up to 5 days, or freeze in large containers or pint-size mason jars for individual servings up to 3 months. Looking for other lentil recipes? Check out my sweet potato, lentil, and black bean vegetarian chili! Love lentils! I would love to curl up with a hot bowl of this delicious soup! I love making homemade soup – this looks like a fantastic one! 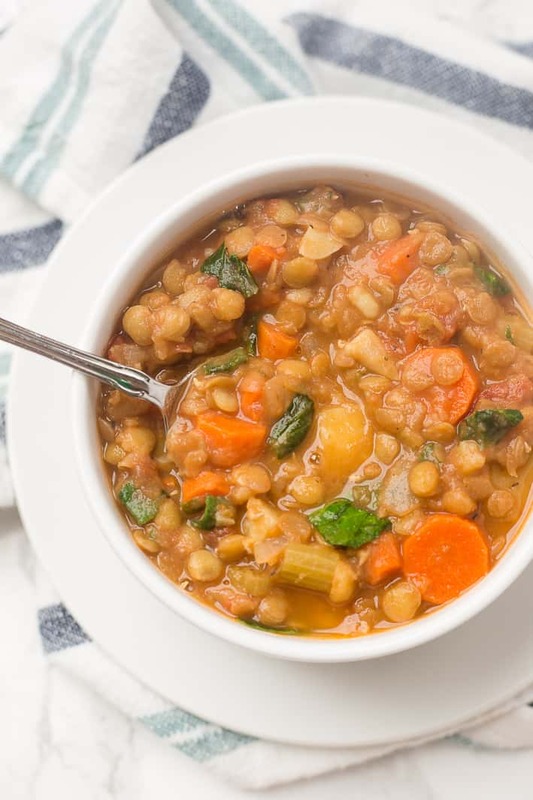 I just had a bowl of this soup and it is truly delicious 🙂 I am always looking for good lentil recipes. Thank you! I’m so glad you enjoyed this lentil soup!!! When do you add the celery? I’m reading through the recipe but can’t find where the celery goes in. 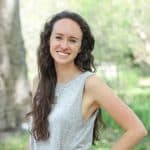 Hi, Jessica! You can add the celery with the rest of the veggies. Updating the recipe now! Hi Liv,. Looked up recipe to use my box of vegie broth and bag of lentils. My husband and I try to stick to a vegan diet after his second heart attack at 56 and twoore stents. The cardiology surgeon said he has two more arteries with 30 percent blockage and if he wants to live and possibly reverse those blockages he need to eat vegan. I love the soup. I cut the spices in half as he is not a big spice guy. Also as a heart patient he needs to limit his salt intake. Your recipe is totally customizable and adjustable. Again I absolutely loved it, and will be substituting yams for potatoes. Yes. It’s perfectly fine without the added salt. That meal was amazing and also so simple. My husband also loved it and he is not always easy to please. I’m so glad to hear that you and your husband loved this lentil soup!! Yum! Utilized veg broth to sauté onion (avoiding oils). I did not use the additional 2 cups of water, only the original 4 cups of veg broth and it became a wonderful stew. Filling and delicious. So very good! Absolutely delicious! I served it over steamed vegetables. Big hit! I love this hearty vegan soup And that you posted about using a potato masher. I’ve been using that for a long time because I also believe in keeping recipe is simple. Thanks for posting this! Just made this and it’s now one of my new favorite lentil recipes. I love soups now that the weather is cold, and this one warms the body while filling the belly. I didn’t use any oil, but used a little cooking spray to soften the veggies. I’ll definitely make this again and maybe try adding a little curry flavor to it. Have made this multiple times and really like it. I’m going to make it again today and use my new hand-held blender. The last time I made this I was visiting my parents and my steak-and-potatoes father said he wasn’t interested, made a sandwich, but then ended up putting a scoop on his plate. Before I knew it, he had poured a whole bowlful and went back for seconds. I’m a lentil fanatic for nutrition purposes and have made lentil soups throughout the past ten years but this is definitely the heartiest one I’ve made. Would never have thought to throw in potatoes and puree. But it’s perfect! Thank you! I’m so glad you and your family enjoyed this lentil soup! I love the story about your dad going back for seconds when he originally wasn’t even interested 🙂 Using a handheld blender would be perfect for that final step! I’ve been making Lentil Soup for years like my Dad did with a ham bone or ham hock. Sometimes I would put ham, sausage or even sliced hot dogs in. There is a Greek Restaurant that I go to for lunch and they make the best Vegetable Lentil Soup I’ve ever had. I suspected Cumin was the unique flavor and set out to find a recipe. If this isn’t it, it’s darn close! Made a double batch because it’s winter and a 1 lb bag of lentils is about 3 1/4 cups. I used 2 cartons of vegetable broth and had about 1/2 carton of chicken broth in the fridge from the other day so that went in also. Considered using yams because I have some but went with white russets. Had canned tomatoes with basil, oregano and garlic so used those. Kale instead of spinach because I like the sturdiness of the kale. Only comment is 1 hour at a slow simmer wasn’t enough to completely cook the potatoes. Maybe should have cooked with lid on but recipe didn’t specify. I know it will be perfect tomorrow. Other than that, it was awesome! Had two steaming bowls with some fresh bread! Definitely recommend and will be my new go to recipe! Sorry Pop! I’m so glad to hear that you enjoyed this lentil soup, Bob! I tend to dice the potatoes pretty thinly to help the soup cook faster, but you can also always leave bigger chunks and cook a bit longer. Lentil soup with fresh bread sounds like the perfect meal, and I’m so glad you found a new go-to recipe! Delicious! Quick and easy to make and quite tasty! Thank you! So glad to hear it, Christy! !